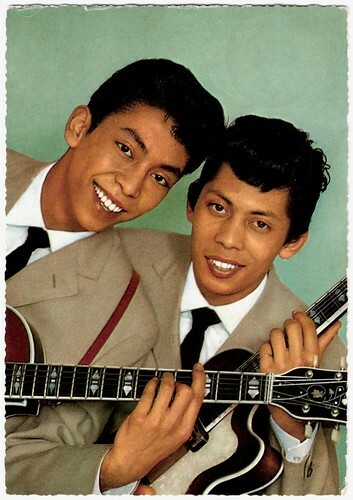 Last night, 11 September 2017, Dutch Indonesian singer and guitarist Riem de Wolff died at the age of 74. 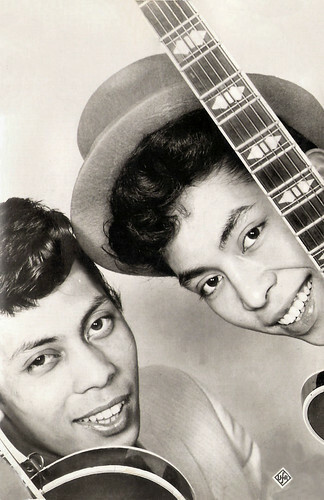 With his brother, Ruud de Wolff (1941-2000), he formed The Blue Diamonds, one of the most successful Dutch pop acts ever. 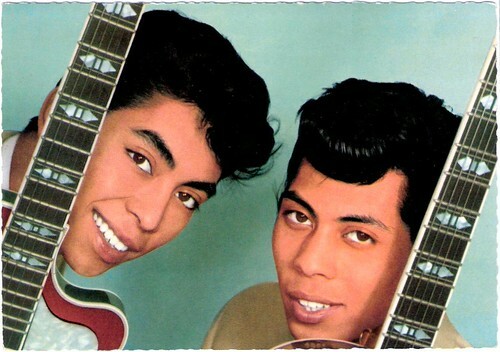 Their hit song Ramona sold 7 million records and became an evergreen. 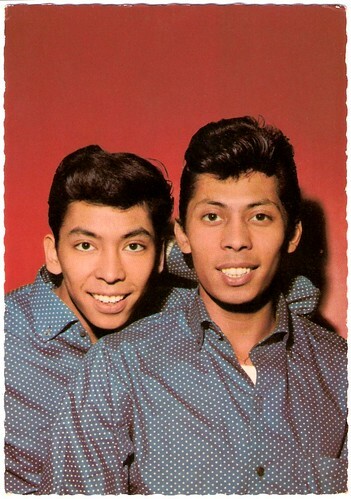 Incidentally the brothers also acted in films and on TV. Dutch postcard by SYBA/MUVA. Photo: Phonogram, Amsterdam. Dutch postcard by Gebr. Spanjersberg, Rotterdam. Dutch postcard by Gebr. Spanjersberg, Rotterdam. Publicity card for the release of the LP Till We Meet Again by Decca. German postcard by ISV, no. H 66. Ruud and Riem de Wolff were born in Batavia on the island of Java in the Dutch East Indies (now Jakarta, Indonesia). 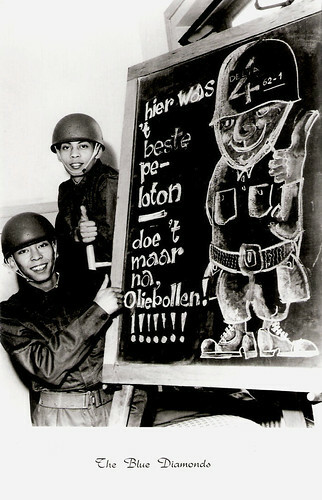 Ruud in Djakarta in 1941 and Riem in Depok in 1943. 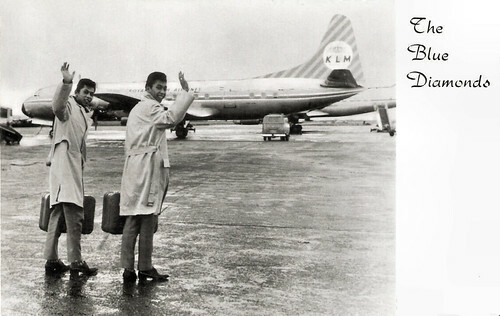 In 194, they came to Holland together with their family. 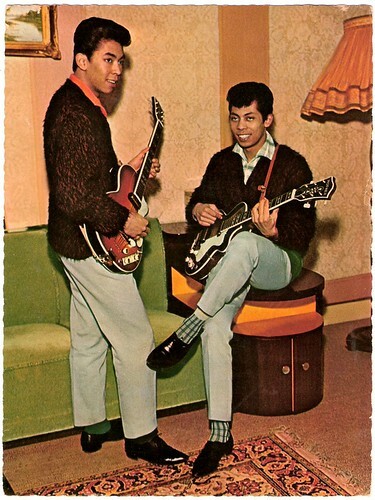 During their school years, they performed in bands like String Extase Boys and The Cool Cats. 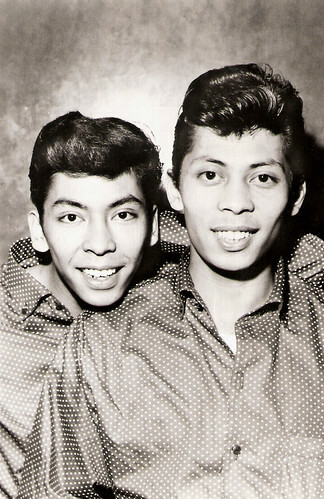 Those bands were exponents of the famous Indo-rock scene (Indo stands for Dutch Indonesian), the cradle for all Dutch rock music way back in the 1950s. The Indo-rockers mixed their rural musical influences with the new Rock & Roll from the USA. 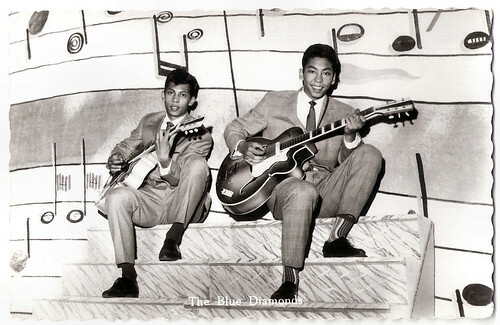 In 1959 Ruud and Riem formed The Blue Diamonds, and recorded their first single, Till I Kissed You, a cover of the Everly Brothers. This was successfully followed by another cover, Oh Carol. 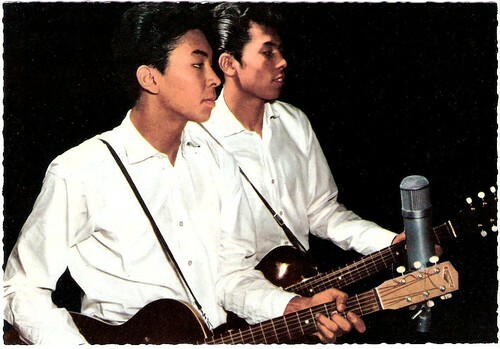 They were so successful that The Everly Brothers forbade to cover more of their hits. 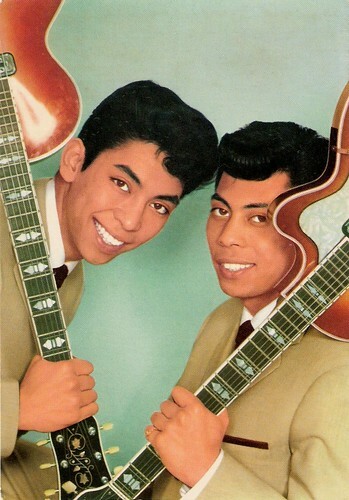 On instigation of producer Jack Bulterman the 'Dutch Everly Brothers' recorded in 1960 a song from 1927, Ramona. The song was originally written for the film Ramona (Edwin Carewe, 1928). It was not featured in the film itself, but was written for promotional appearances with the star of the film, Dolores del Rio. 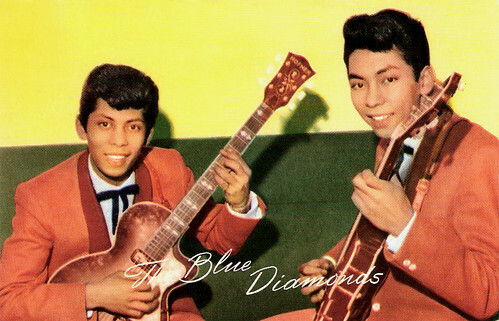 The Blue Diamonds' up-tempo version of the slow waltz became a worldwide hit: number one in the Netherlands, Belgium, Switzerland, Austria, France, Spain, Germany, Japan, Thailand, and Indonesia, and it even reached the American Billboard Hot 100: #72. There were five different language versions of the song. 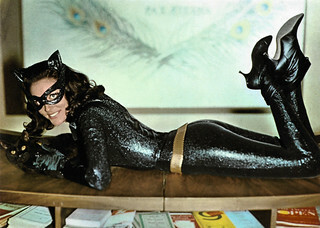 The English version sold over 250,000 copies in the Netherlands (the first record to ever do so) and a German version sold over one million copies in Germany by 1961. 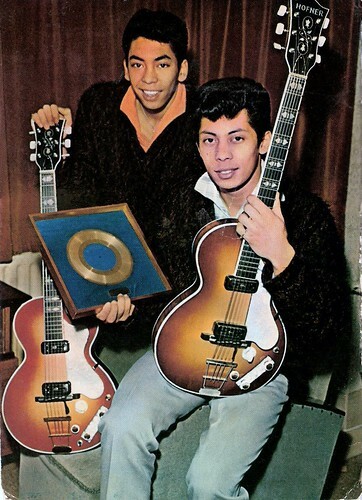 By 1963 all Ramona versions together had sold seven million times, and The Blue Diamonds got the Dutch Edison award for the song. Dutch postcard by De Gruyter, no. 6. (De Gruyter was a Dutch grocery chain, which enclosed postcards of "famous stars from the fascinating world of cinema and hit parade" with their soap Trexop). Dutch postcard by Gebr. Spanjersberg N.V., Rotterdam, for Decca, no. 57. Photo: Combi Press, Amsterdam. Dutch postcard for Decca, no. 907. Dutch postcard by C.K.Z., Zeist, no. 387. 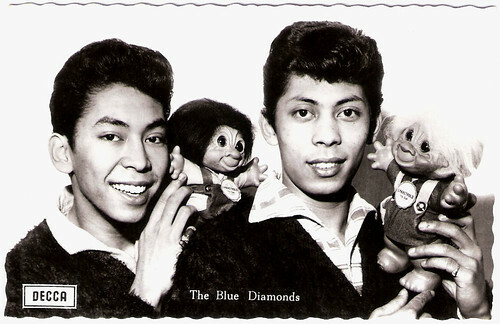 As they had hits in the Netherlands with songs in English, The Blue Diamonds adapted their songs for the German market by translating them in German. Ramona became a golden record in Germany. Their popularity lead to many appearances on German television, and also in two Schlagerfilms. The comedy Und du mein Schatz bleibst hier/And You My Dear Stay Here (Franz Antel, 1961) was an Austrian production with Vivi Bach, Hans Moser and Paul Hörbiger. The German production Davon träumen alle Mädchen/That’s What All the Girls Dream Of (Thomas Engel, 1961) starred Harald Juhnke and Marion Michael. Their hit Ramona was the title song of another Schlagerfilm, Ramona (Paul Martin, 1961) starring Senta Berger, but in the film the song was interpreted by Willy Hagara. 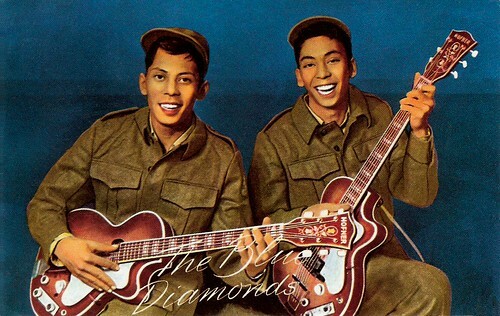 The Blue Diamonds had more hits in Germany like Wie damals in Paris (1961), Little Ship/Blaues Boot der Sehnsucht (1962) and Sukiyaki (1963), but their military service (1964-1966) and the rise of the Mersey Beat slowed down their careers. 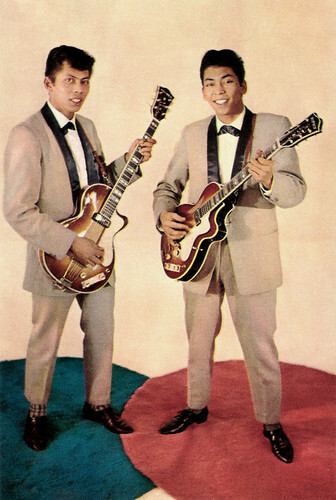 Their last German hit was Gib dein Wort, Linda Lou (1965) which they performed at the Deutschen Schlager-Festspielen. They reached the 6th place at this contest. 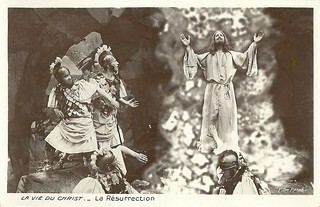 Dutch postcard by Uitg. Takken, Utrecht, no. 4992. Photo: N.V. Phonogram, Amsterdam. Dutch postcard by Hercules, Haarlem, no. 662. Dutch postcard by Gebr. Spanjersberg N.V., Rotterdam, no. 5754. With Caterina Valente. Dutch postcard by Uitg. Takken, Utrecht, no. AX 4821. Photo: Decca. During the late 1960s and the 1970s Ruud and Riem de Wolff toured around the world, and especially in Western Europe and the Far East they stayed popular. From 1970 till 1972 they performed in the Dutch stage musical Tien miljoen geboden (Ten Million Commandments) by Seth Gaaikema, which was a huge success. In 1971 they had a hit in Germany again with Ja, es steht schon bei den Propheten geschrieben/Nimm mich mit nach Capriciano. Since then they continued to perform on stage and TV. In 1990 Ruud was offered the leading part in the film My Blue Heaven (Ronald Beer, 1990). The Dutch film told the story of an Indo family who starts a restaurant, that is burned down by racists. 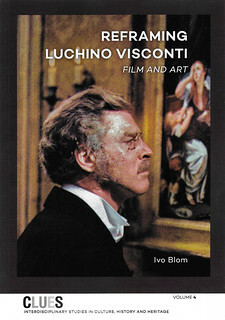 The film was not a commercial success, and Ruud’s film appearance was not repeated. 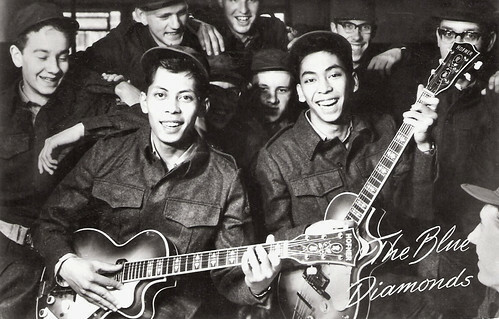 The Blue Diamonds was one of the few bands in the world where only death of one of the members could take it apart. Ruud de Wollf died, not very long after the group's last appearance at the end of 2000. 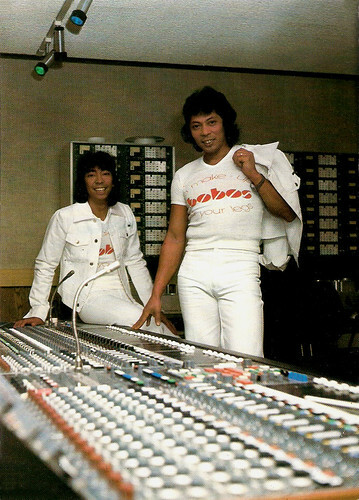 They had recorded circa 130 records, which sold over 20 million copies. After his brother's death Riem de Wolff first wanted to stop, but he decided to continue to perform and release albums. He appeared in the Dutch film Ver van familie/Far Away From Family (Marion Bloem, 2008), an adaptation of a novel of its director. Marion Bloem is also of Dutch Indonesian heritage, and told the tale of a young woman, who, following the death of her stepmother, leaves her life in the USA behind, and rekindles the bonds with her Indonesian-Dutch grandmother. In 1987 the listeners to the Dutch Radio 5 station chose Ramona as the Best Pop Hit of the 1960s. 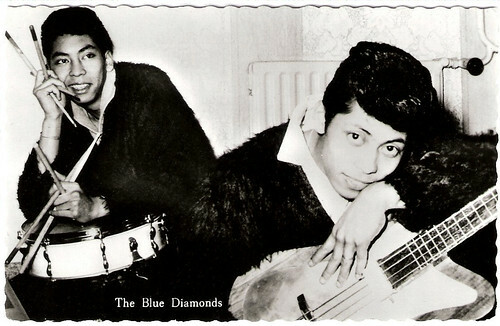 The Blue Diamonds stood on top of the Dutch music scene and far beyond its borders for 40 years. Riem de Wolff continued to perform, now with his son as The New Diamonds. Last week he had a hemorrhage, followed by a second one this weekend. Monday night, he died peacefully, surrounded by his family. He was 74. German postcard by Krüger, sent by mail in 1964. At the backside is an advertisement for the single Ramona and other Fontana records of The Blue Diamonds. German postcard by ISV, no. H 83. Photo: Philips. Please double-click to see this picture better. German postcard by ISV, no. H 84. Dutch postcard by Emdeeha B.V., Oosterbeek, for Bobos Jeans and Jackets. 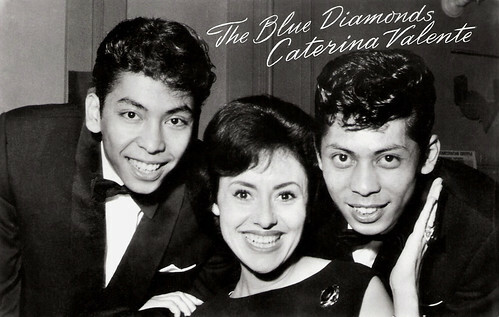 Ramona (1960) by The Blue Diamonds. Source: Roquitoyo (YouTube). Sources: Blue Diamonds.nl, IMDb, and Wikipedia (English and German).